Much as I love the iPhone’s touch screen, there are days when I would happily sell my hypothetical children for some buttons. I usually cringe a little every time I see an on-screen joystick or D-pad, so I never thought I would see the day when I had something good to say about on-screen controls, but Earth Is Gone’s dual-stick action is surprisingly good. When I say “surprisingly good”, what I really mean is “super responsive and smooth”; I scarcely noticed the lack of physical joysticks. This is a pretty significant accomplishment when you consider that Earth Is Gone is a dual stick space blaster that is all about the controls. If you’ve been disappointed by the controls of games like Ace Omicron, this is the one to try. In addition to the movement and firing joysticks, there are buttons to heal, bomb, and release an EMP blast to paralyze your enemies. These abilities are unlimited, but they take time to recharge after you use them. The rest of the game, unfortunately, is pretty standard, perfectly adequate, but nothing to get super excited about. Enemies come in waves, with a boss battle at the end. The action definitely becomes challenging in terms of numbers, but enemy ships are basically identical each time, and with each wave essentially the same, the action gets repetitive very quickly. The game’s sound, with its driving rock soundtrack and constant blaster noises, isn’t particularly annoying and generally well-suited to the epic, fast-paced battle style, which is about all you could hope for with this type of game. The graphics are also appropriately pleasant, if not particularly remarkable. Currently, the mechanics are rock solid, but the game content is on the shallow side. There is only one single-player option and a leaderboard, but developers are promising more single and multi-player content, which have a lot of potential. The game has a lot of room to grow into, but they’ve made a good start. If future updates can make the game more substantive, Earth Is Gone will definitely become a major player in the crowded world of space shooters. 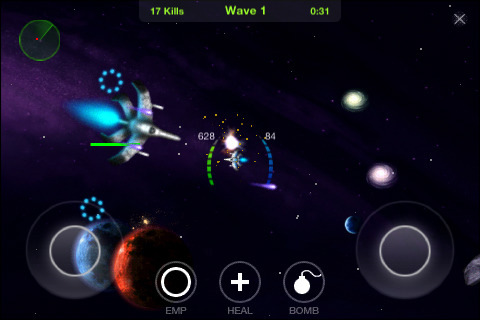 AppSafari review of Earth Is Gone was written by Tracy Yonemoto on May 19th, 2010 and categorized under Action, App Store, Games. Page viewed 5192 times, 4 so far today. Need help on using these apps? Please read the Help Page. This is a really great game that should be doing better than it is. I preferred it to Meteor Blitz and I love Meteor Blitz. Very well put together polished responsive dual stick shooter.